Hold on just a little longer, Gifted fans. The show is officially back on Sept. 25 and set to dive right back into the tumultuous events of last season’s finale. We’ve got a new collection of first-look photos from the premiere to share below, along with some swishy new cast promotional photos. While we’re still waiting for official loglines for the premiere (we’ll update here as soon as they are sent our way from FOX**), we can offer you the following HUGE interview we did with the cast we over the summer, in which Emma Dumont, Skyler Samuels, Stephen Moyer, Natalie Alyn Lind, Sean Teale, and Blair Redford all talk about where the show will take our favorite heroes and villains over the coming season. 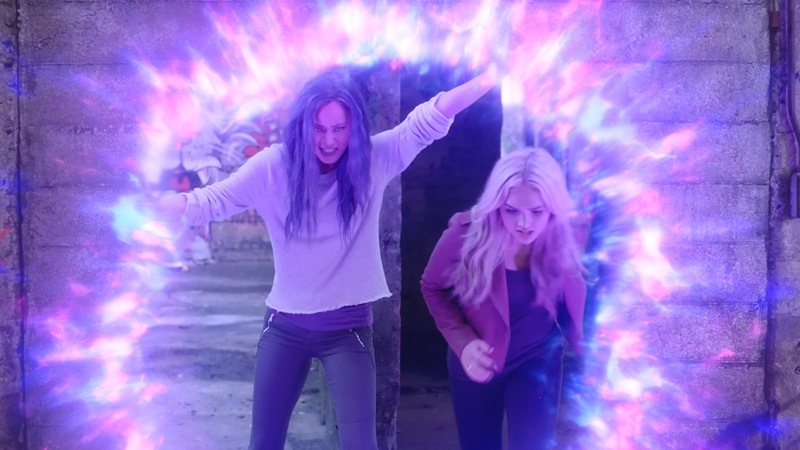 Remember, the season two premiere episode of The Gifted airing Tuesday, Sept. 25 (8:00-9:00 PM ET/PT) on FOX. Follow our official Twitter @ScreenSpy for more Gifted scoop and interviews. Reeva Payge (Grace Byers) purges the Inner Circle of those who disagree with her, leaving her completely in charge. Then, fast-forward six months, when the Mutant Underground saves a girl, but not her family, from a Sentinel raid. Against the group’s wishes, Eclipse and Caitlin meet with a criminal hacker to get info on the Inner Circle. Meanwhile, Polaris prepares for the birth of her baby, her contractions magnetizing anything metal and wreaking havoc. She also makes Andy promise to save the baby, no matter what. Cast: Stephen Moyer as Reed Strucker; Amy Acker as Caitlin Strucker; Sean Teale as Eclipse/Marcos Diaz; Jamie Chung as Blink/Clarice Fong aka Clarice Ferguson; Coby Bell as Jace Turner; Emma Dumont as Polaris/Lorna Dane; Blair Redford as Thunderbird/John Proudstar; Natalie Alyn Lind as Lauren Strucker; Percy Hynes White as Andy Strucker; Skyler Samuels as Frost Sisters/Esme, Sophie and Phoebe; Grace Byers as Reeva Payge. Guest Cast: Brad Carter as Wire, Hayley Loveitt as Sage, Renes Rivera as Bulk, Danube Hermosillo as Cristina, Vince Pisani as Dr. Kelsey, Bianca Tarantino as Dawn, Christian Finlayson as Young Reed.